No video, just listen to Anna Russell, professional opera comedian, explaining the Ring of the Niebelungen as only a dry-witted Briton could. Also, “opera comedian” needs to go on my daughter’s list of possible career choices. Just sayin’. We have seen that the powerful and good elves of Norse mythology over time became the powerful and malevolent nightmares of later Germanic folklore. In that vein, I need to say a word or two about the legend of the Erlking. As a distinct figure, the Erlking is a relatively recent addition to elf-lore. Even so, he has deep roots. The Erlking comes from Scandinavian folklore, from a time when, as in England, elves had become depicted as creatures of dread. Originally, though, “he” was apparently a “she”: a deadly but seductive elfin woman. In his 1778 ballad, Johann Gottfried von Herder freely translated the generic “elfin maid” (Danish, elvermø) as Erlkönigs Tochter (“Erlking’s daughter”). In Danish folklore, old burial mounds were feared to be the dwelling place of the Elverkonge, the king of the elves. Eventually, this figure and his daughter were collapsed into a single character. “Erlking” is a roundabout translation from the original Danish Elverkonge, “Elf-king.” In a particular Danish dialect, Elverkonge becomes Ellerkonge or Ellekonge, which was later understood with reference to the elletrae or “alder tree.” In other words, the “Elf-king” became the “Alder-king.” Some argue that this is purely a mistranslation. Others suggest that the change is intentional, a euphemism of the sort we have already seen when the superstitious avoid explicit mention of elves once their nature has turned malevolent. For what it’s worth, the alder tree has long been associated with faeries in Celtic folklore. In the original tale, a knight named Sir Oluf is riding to his marriage but is bewitched by the music of elves in the woods. An elfin maiden appears and invites him to dance with her. When he refuses, she strikes him and sends him away. He is dead by the following morning, when his bride-to-be finds him. The next version of the legend comes from Johann Wolfgang von Goethe. 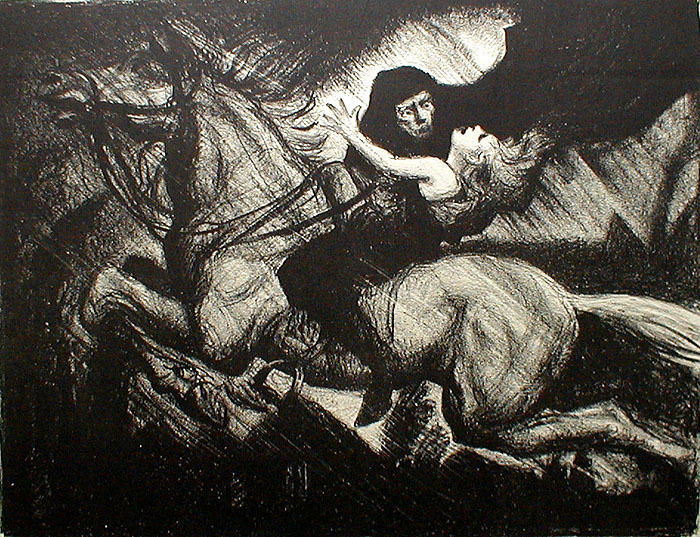 In his 1782 poem Der Erlkönig, the antagonist is the Erlking himself. In this version, the Erlking preys on children and his motives are never made clear. He is a force of death, not merely a magical woodland spirit. There are a number of English translations of Der Erlkönig. Matthew G. Lewis (PDF) translated the poem in 1796. A contemporary translation has been done by A. Z. Foreman. Goethe’s poem tells of a father riding through the forest with his feverish young son. The son is aware of the presence of the foreboding presence of the Erlking, who calls to him to leave his father and join him in his faery abode. The father, however, believes the son is merely hallucinating. In the end, the father arrives at home, but not before his son dies in his arms. Matt Soniak has posted a fascinating article at Mental Floss about Christmas in Nazi Germany. Wherever possible, in both public and private spheres, Christmas’ religious aspects were de-emphasized and replaced with nationalistic and pagan symbolism. “People’s Christmas trees,” were erected in many towns and cities with the traditional star topper replaced by swastikas, Germanic “sun wheels” or the Nordic “sig runes” used by the SS as their insignia. These trees became the subject of numerous Christmas carols rewritten with no reference to Christ or religion, as well as the focal point of Christmas celebrations, events and activities organized by like the Hitler Youth, the League of German Women and the German Workers Front and the state. The Nazi Party organized massive celebrations across the country where the Hitler Youth reenacted solstice rituals and soldiers swore “oaths of fire” before huge bonfires. Joseph Goebbels often appeared at celebrations like this at the tree in Berlin, handing out presents to children like a jackbooted Santa Claus. Santa, of course, still existed in Nazified form, as someone had to bring gifts to good National Socialist children. Instead of St. Nick in the red robe of a bishop, though, he came in the form of the Norse god Odin, riding around the planet on a white horse to announce the coming of the winter solstice. Presents were still exchanged among families, friends and co-worker, sometimes with a depraved twist: the special Yule lanterns that SS leader Heinrich Himmler handed out as gifts to his officers were made by the inmates at the Dachau concentration camp. In the Alps, Saint Nicholas has an accomplice, a frightening creature called Krampus who punishes misbehaving children. 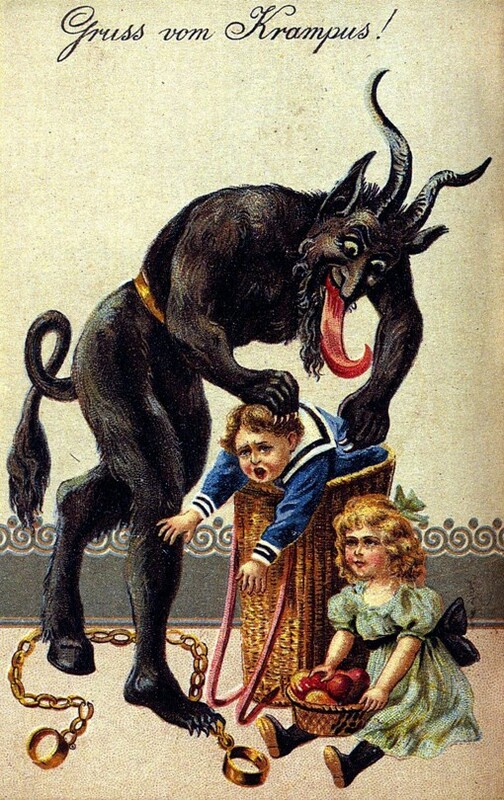 Where Saint Nick’s sack is filled with goodies, Krampus uses his sack to carry off naughty children to his lair. The German-speaking world in fact has a number of traditions about a darker, more dangerous companion who is associated with Saint Nicholas. Between them, they pull off a kind of “good cop-bad cop” routine, with Saint Nicholas the kind and benevolent gift-giver and Krampus and his kin (Knecht Ruprecht, Zwarte Piet, etc.) as the threatening punisher of bad little boys and girls. So no matter who’s coming to town, you’d better watch out! Krampus is a beast-like creature, although the particulars of his appearance vary from place to place. He has an assortment of animalistic traits including fangs, tusks, horns, and horsetails. There is an excellent article on the appearance and origins of Krampus at Atlas Obscura. Where did Krampus come from? He is clearly a holdover from pre-Christian Germanic traditions. With his bestial form, he bears a resemblance to woodwoses, satyrs, and other wild creatures of the forest. Although the church made efforts to discourage Krampus traditions, they persisted. By the seventeenth century, Krampus had become paired with Saint Nicholas and made part of Christmas celebrations of Austria, Bavaria, and other Alpine locales. Perchten are the followers or attendants to Perchta (or Berchta or Bertha). This ancient Germanic goddess is a “guardian of the beasts.” In folklore, she is associated with spinning thread, an activity often associated in folklore with destiny or fate. In the summer, she blesses the flocks as the shepherds bring her wool. She oversees the spinning during the twelve days of Christmas, and is very particular about finishing the spinning on time. Any delay is said to bring misfortune on those who are responsible. Perchta might appear as a stunningly beautiful woman dressed in white or as an old crone, what we might imagine as the traditional “Halloween witch.” Perchta is apparently the basis of the legends of La Befana in Italy and the “White Women” of Germany, the Netherlands, and France. Jakob Grimm thought her male counterpart was Berchtold, the leader of the Wild Hunt in sixteenth-century German folklore, but this may be simply a replacement for the feminine Perchta in earlier versions of the legend. There are a number of beings similar to Krampus or Perchten in central and south-central Europe. These include the south German Quantembermann (“person of the four ember days”), the Slovenian kvaternik, and the Albanian bardha.